This entry was posted on January 30, 2017, in . Thanks to the crowd funding and testing support of the DNAadoption community I was able to write a new tool. Now it’s ready, it’s free, and it’s online, which means it works for Mac users too. You upload a text file in ahnentafel format and it creates a GEDcom file for you to download (or cut and paste). It was written to convert the DNArboretum output but with some massaging can take any ahnentafel text file, I hope. In my previous blog post about the return of DNArboretum, I suggested that if ten people gave me $5 then I would write this tool. It was funded within 36 hours. Thank you all for the quick response. This entry was posted on October 3, 2015, in . 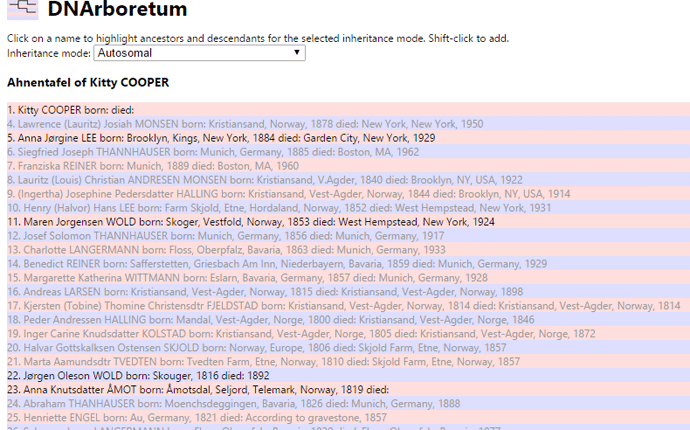 There is a new tool, a chrome add-on called DNArboretum, that will generate an ahnentafel ancestor list from a Family Tree DNA tree or from the old format 23andme tree (not myHeritage). An ahnentafel is a very clever and condense way to show all your ancestors. When trying to match up with a DNA relative it is particularly useful since you can quickly scan their ahnentafel for places and names in common. Obviously it would be better to automate that comparison but with misspellings and Norwegian names that has not worked well for me. However it might work for you, so click here for my blog post about how to use automation to compare GEDcoms. This is part of my ahnentafel as generated by DNArboretum from my tree at Family Tree DNA when logged into another account there. I clicked on my great grandmother Maren Wold and it bolded all her ancestors and descendants. Note that my parents are missing because they are marked private. Did you know that there are chrome add-ons that can collect pedigree trees from many genealogy sites and DNA testing sites? These tools can collect a tree of ancestors as an ahnentafel list which is a very useful and compact format to scan for common ancestors and locations. Click here for my post explaining an Ahnentafel list and the tool DNArboretum to create one from a tree at Family Tree DNA. The pedigree view of a family tree on Ancestry.com or MyHeritage can also be collected into an ahnentafel list with another chrome add-on, a tool called Pedigree Thief (click here to download it). When it is just a few new relatives at Ancestry , you don’t need those add-ons. After all, it is easy to use the Tools menu on the Profile Page of the ancestor you want from a tree at Ancestry.com to copy over a few people. In fact, if you copy one person over, you can click back to the original tree and copy them again in order to get their whole family group, just like in an Ancestry hint. I do recommend that you check sources and make sure that this is good information. Even if you are making a Quick & Dirty tree (Q&D) for an adoptee, it is best to check it over, as some trees on Ancestry.com are quite unrealistic with parents born after their children and other such errors.